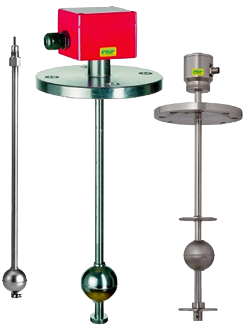 Model FN04 Liquid Level Measuring Sensors utilize a float fitted with permanent magnets to directly transmit information about changes in the liquid level. The sensor float is raised or lowered with the liquid level. The magnetic field exerted by the float magnets operates a reed contact / resistance measuring chain in the guide tube. The output signal is a voltage value proportional to the fluid level. Model FN04 liquid level sensors are suitable for measuring and monitoring the level of almost all types of fluids that will not corrode or damage the sensor materials. They may be used in containers up to six meters high.